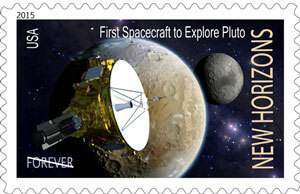 Let’s get ourselves a New Horizons-Pluto stamp! You may have heard over the past few days of an effort to recognize the New Horizons mission now en route to Pluto and due to arrive in 2015. Yesterday, Alan Stern, the mission’s project scientist, called me and asked Astronomy magazine to step on board as a partner in the effort. Now, many of you know the folks here at Astronomy are Pluto backers. I was a friend of Clyde Tombaugh and considered it a great honor to have known and observed with him quite a few times before his death in 1997. Most of us here feel the “demotion” of Pluto to dwarf planet status was a silly exercise by the International Astronomical Union. And we’re all excited to see the last great unexplored realm of the solar system reached in the flyby that will happen just three years from now. So, I strongly urge you to visit this page and sign the petition to honor New Horizons and the exploration of Pluto with a United States stamp. The proposed design you see was executed by another good friend of the magazine, planetary scientist and astronomical illustrator Dan Durda. For more on the effort, see the New Horizons mission news release. Watch for more on our website, www.Astronomy.com, in the coming days about this effort. And thanks to Alan Stern for all he is doing to explore the last unexplored . . . well, planet.